The Bills all season have lived on big plays and turnovers. Sunday in New Jersey against the Giants, they did get a couple big plays, but lost the turnover battle 2-0, and with it the game, falling to 4-2 after a 27-24 loss. Lawrence Tynes kicked a 23-yard field goal with 1:32 remaining for the difference. Ryan Fitzpatrick had one last shot, but his fourth and five pass from his own 25 fell incomplete, saving the Giants three-point win. 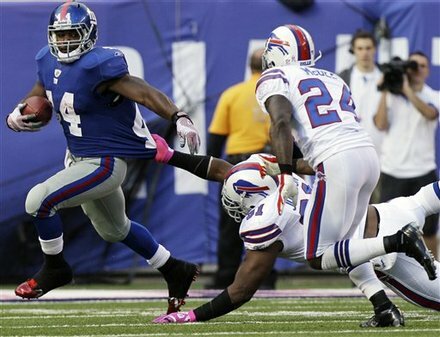 Ahmad Bradshaw ran for three one-yard touchdowns as the Giants (4-2) recorded their first home win over the Bills since December 6, 1970. Bradshaw finished with 104 yards on 26 carries, while New York quarterback Eli Manning threw for 292 yards on 21-of-32 efficiency. Fitzpatrick had 244 yards through the air and two touchdowns on 21-of-30 passing for Buffalo, but was picked off twice by Corey Webster. The Bills tied the game at 24-24 when Fitzpatrick hit Stevie Johnson for a nine-yard scoring strike with just under nine minutes to play. 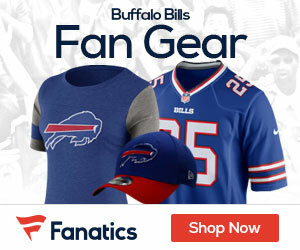 Fitzpatrick was intercepted by Webster at the New York four-yard line on Buffalo’s next possession. The Giants moved the ball down the field and were facing a 3rd-and-6 from the Buffalo 22. Manning’s throw to Hakeem Nicks was off the mark, but Bills cornerback Drayton Florence was flagged for pass interference for the second time on the drive. Bradshaw was stopped short of the goal line on the next play. He then lost four yards before Leodis McKelvin knocked down Manning’s pass. Tynes’ kick put New York ahead, and Buffalo’s final series ended with a turnover on downs. Down 7-0 after Bradshaw’s first trip to the end zone, the Bills quickly pulled even when Fred Jackson went up the middle and set a personal best with an 80- yard TD run on the first play of the ensuing drive. Fitzpatrick and Naaman Roosevelt then hooked up for a 60-yard touchdown with 24 seconds left in the first quarter. After Tynes drilled a 26-yarder, Manning hit Nicks down the left sideline for a 60-yard gain. Two plays later, Bradshaw reached across the goal line to give the Giants a 17-14 lead. Rian Lindell’s 200th field goal as a Bill — a 49-yarder — tied the game at halftime. The Giants retook the lead in the third quarter when Bradshaw leaped over a defender. New York then was unable to score any points after a Fitzpatrick interception, as Buffalo’s Alex Carrington blocked Tynes’ 50-yard attempt.